Decided to build a small, simple campaign to give the recent Field of Glory II battles between myself and @Nelson1812 some context. I nicked and adapted a map from the GMT Games Time of Crisis board game off the web to use for this. The setting for this is a Roman Empire-wide civil war between the rightful heir to the title of Emperor, Rico Africanus... and the evil upstart usurper Nelsonius. I have randomly drawn the set up -- @Nelson1812 's provinces are the RED legions, mine are the BLUE. There are also the external threats to the empire, the Barbarian Franks, Alamanni and Goths to the north and east... and the Parthians in the Middle East -- which might become restless and decide to invade and raid the Roman Empire. There are 12 regions in Roman Empire plus the surrounding Barbarians and Persians/Parthians. When we start, I'll randomly draw what provinces we each start with and the player who doesn't control Rome/Italia goes first. 1. Attack a neighbouring province - battle set up in Fields of Glory with terrain matching area, if attacker wins, he captures the province. 4. Move a navy from one sea zone to an adjacent sea zone to fight for control. 6. 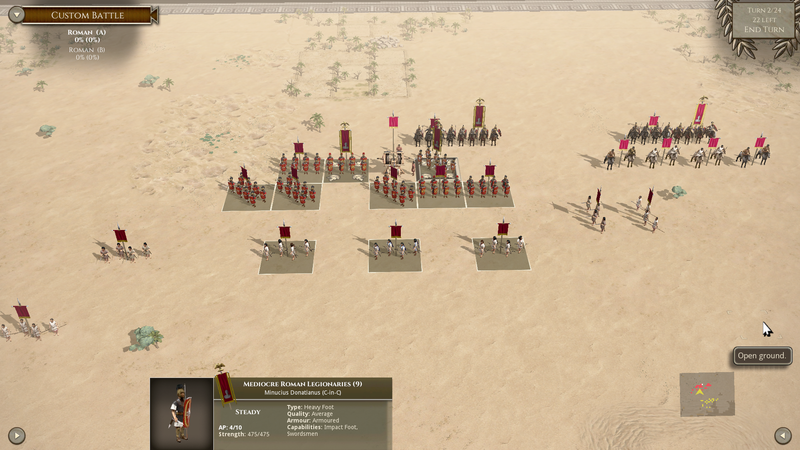 Attack to try and recapture a Roman province from Barbarian/Parthian/Persian invaders. 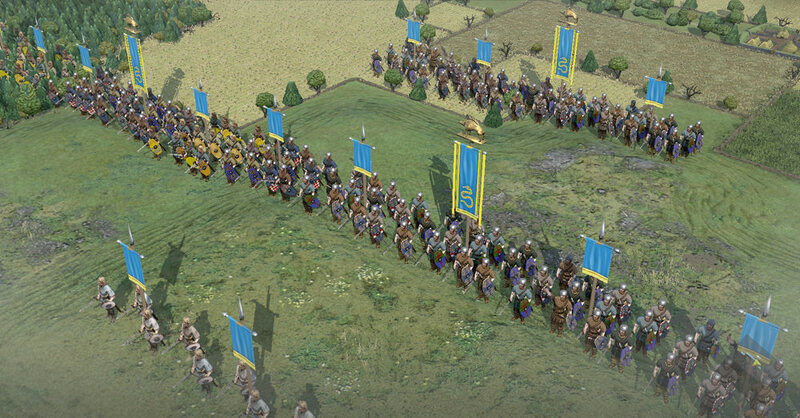 In the Field of Glory II battle, the Barbarian/Parthian forces will be "auto selected" by the AI. These raids will stop if repulsed by Romans. If the Barbarians win a province, they stop and defend the captured province against Roman counter-attack -- they never advance further. 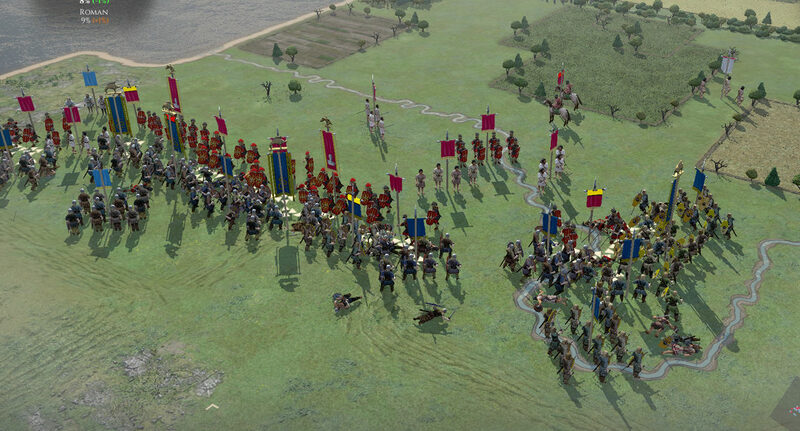 We will be using the Romans 105 - 25 BC faction -- and whatever equivalent non-Roman opponents fit best. Whoever's turn it is next between the two of us gets first dibs at counter-attacking the Barbarian-captured province. Romans cannot attack outside of bounds of Empire. Winner at end of ?? turns who controls most provinces (or all of them) wins the campaign. Things get interesting right off the bat. The die roll immediately results in an invasion by the Barbarian Franks into GALLIA -- so as RED player goes first, @Nelson1812 will have to defend his province against a horde of invading Germanic tribesmen as his first turn action. I will set up the battle using the Germanic Foot Tribes 105 BC - 259 AD and play them with random force pick against @Nelson1812 's Romans. Nice; attractive, clean, and simple. Ave Caesar! Felix et fortuna. Always remember the order ... first pillage, THEN burn! Beautiful concept. Going to be fun following this. Salutations, please overlook the method and means of this communication. should my, our plans go awry. the son of Jupiter, my uncle. acknowledge his illegal claim to the Republic. to maintain the bloodline and heritage rightfully chosen for us, by Rome and the gods. and deal them such a blow the other tribesmen will shudder with fear at any further thought of rebellion. Be firm, burn and crucify their leaders. and his band of Serpents. May our gods favour the bold! "Nelsonius vs. Rico Africanus" ... HA HA HA!!! LMAO! ONLY GREAT! So funny! Wish you all a lot of fun with that project! 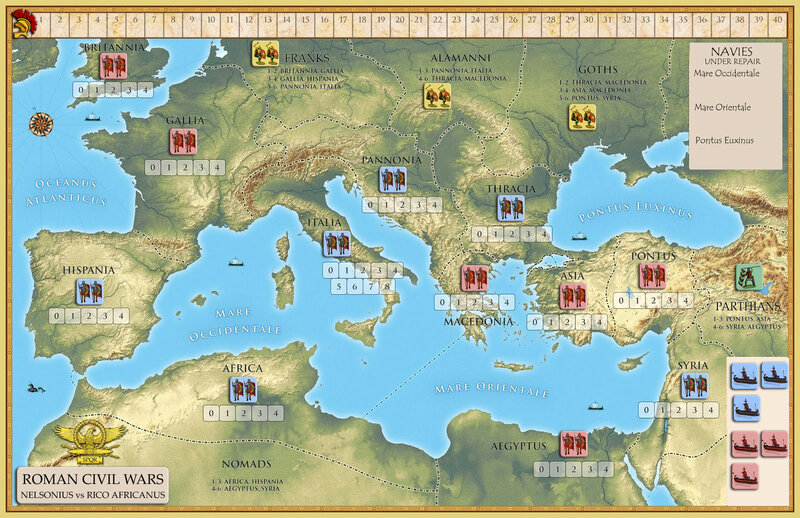 Yes... the Roman left has indeed collapsed and is overrun by the Franks ... and after a rash break through the Barbarian lines , the Roman general and Nelsonius's brother in law, Salvius Abanus has fallen (center bottom of screen shot)... looks like the Barbarians might just carry the day. My Sister, you of aware Saluius death may cause our own deaths should his correspondence fall into the hands of supporters of Rico Africanus. Destroy all his private correspondence, in addition to your own concerning Rico Africanus. Rico’s spies are everywhere. Information concerning the commander in chief’s death has already gone astray, in my own household. The blame for which has already been attributed to my grandchildren. If Rome was to find’s out that our family had cajoled your husband into believing that Rico Africanus was a traitor or that you and not Rico had secretly supplied those barbarians with gold to rebel against Roman rule. Rico would have our heads. Your husband’s death, leading his men on that battlefield, setting an example to Rome and it's people may yet play to our advantage (and survival). May Rome revolt against that imposter and his supporters. Making him pay for the poisoning of our uncle, and that he be brought to heel and publicly executed! I bear sad news concerning your brother-in-law General Salvious Abanus. He has fallen in battle. Germanic Foot Tribes boarding Gaul, have revolted and have moved against the villages and towns along that frontier. 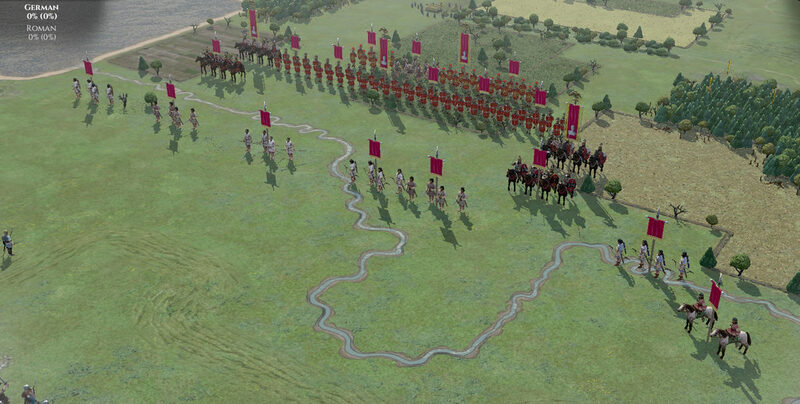 Commanding the legionaries along that border he lead a medium force into a valley. Sighting a small band of barbarians situated on the slopes. His forces began to cross a fordable stream, in their attempted to engage or repel the enemy. He managed the crossing, but from the dark recesses of the woods to his left, archers appeared, and then on the hilltops ahead… a host of the barbarians pushed forward. The size of the original force had quadrupled. The Barbarian armies of the Frankish general Bertulf, Son of Hroderich were victorious and now rampage and plunder through the rich province of Gallia. Rumours persist in the capital that it was bribes of Roman gold that enticed the chieftain to embark on his invasion to weaken Nelsoniu's hold on the territory. With the enemy archers, and javelin throwers threatening on our left, his horse archers teasing on the right flank, the Barbarian centre pushed forward, down towards our legionnaires. Some legionnaires still fording the stream our men prepared to do battle. The cavalry attacked the flanks with some success, but our left flank began to give way. Only to trip on his own laurels … fortunately the barbarians brought his suffering to a swift end. Hmm ... "mediocre Roman legionairies" ... must be a trick. 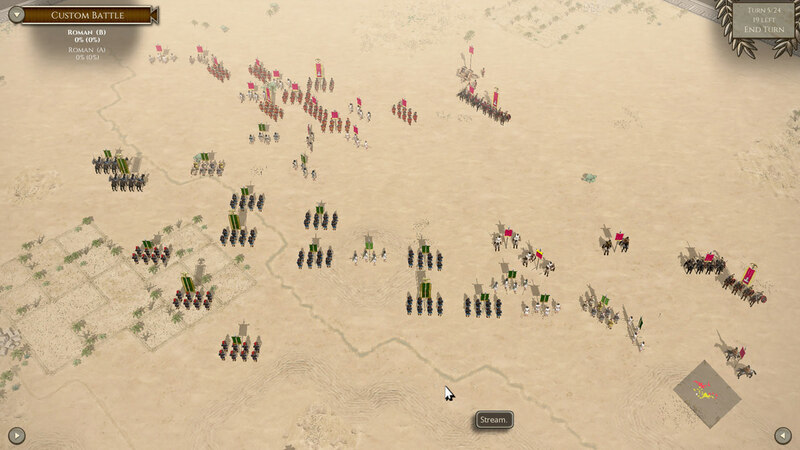 Fighting in Egypt ... much roomier map, a lot more room to maneuver. My troops on the bottom of the map swinging round to counter @Nelson1812 's flank march on my left... this should get interesting.